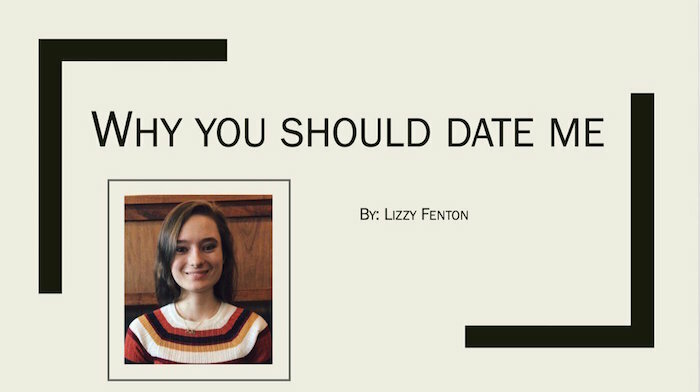 It turns out that a Powerpoint presentation is not the best way to get a date. There are many subtle things you can do to try to get your crush to date you. Of course, you can always skip right over subtle and hurtle into charming/possibly slightly creepy/still really funny territory. 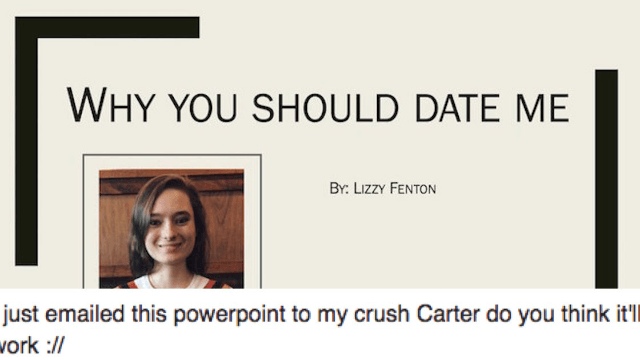 A woman named Lizzy Fenton chose that route, and actually emailed her crush (Carter) a Powerpoint presentation she'd put together in an attempt to get him to take her out on a date. The presentation consisted of four pages. The first was the title card, which outlined the topic of the presentation clearly. 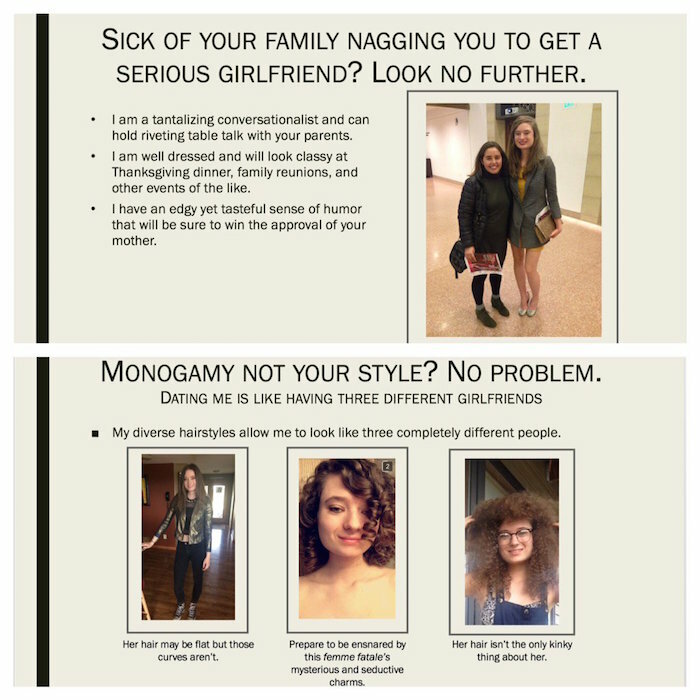 The second and third slides highlighted both her usefulness in dealing with parents and her ability to spice up the relationship (she can look like different girls simply by changing up her hairstyle). The third slide dealt with scientific projections proving that her breasts will get bigger over time ("each breast will be roughly the circumference of a human head by the year 2025"). 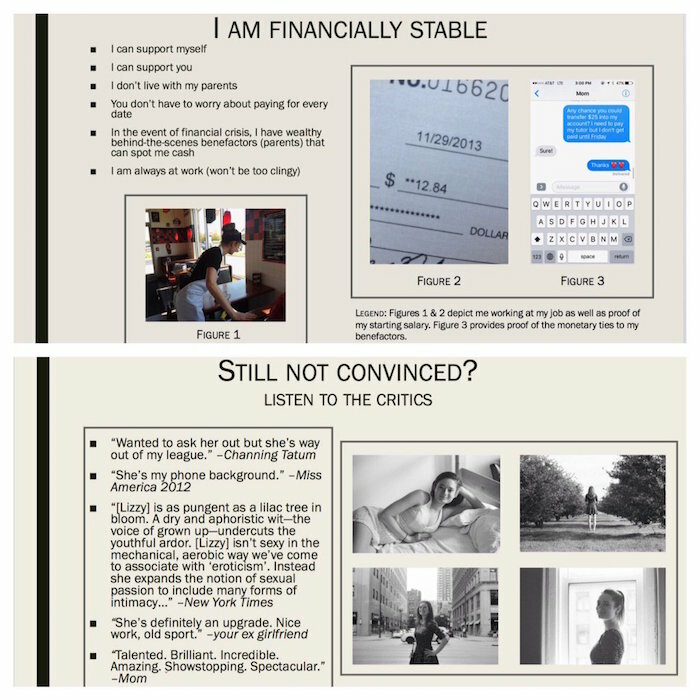 The final two slides highlighted her financial stability, and included some blurbs praising her, like one from Channing Tatum, who apparently claimed "she's way out of my league" (lol). Even your ex-girlfriend approves! That's a first. So did all her hard work convince him to give her a chance? But on the upside, it sounds like Microsoft Office might be interested.